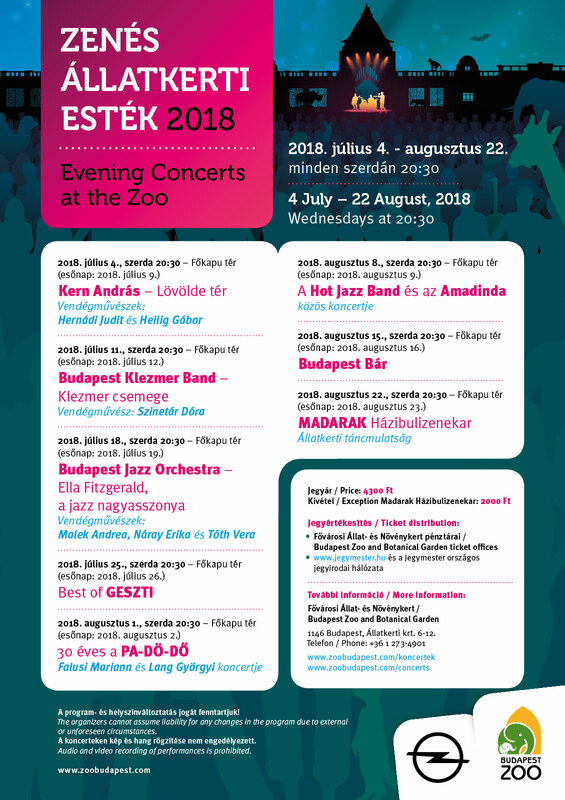 Evening Concerts at 8.30 p.m. Budapest Zoo. If it is Wednesday keep in mind where to be from July, 4. till August, 4. 2018. Fill up yourself at an incredible venue, relax and enjoy the voice and sound given by well-known musical artists. This summer, eight summer concerts are awaiting music lovers at the Budapest Zoo and Botanical Gardens. This will be the lineup to the 17 times in this concert series, which this year is the home surrounding the Main Gate Square. In previous years, the concert was organized by the Japanese garden, the palm house and the big lake, but these sites have outgrown line. This year’s venue magnified the size of the site 800-1000 people can fit. During the summer, everyone can choose according to their taste of music styles, whether it suites jazz, dixieland, the finest representatives of klezmer music Concert. In this series, also offer the light classical music as well. The occupation of seats is available in order of arrival. Tickets to purchase at the Zoo’s ticket office on the spot 3500HUF. Before the start of the concerts the guests may enter the Zoo from 7 p.m. and take a visit to the garden, visit the Aquarium and the Palm Tree and enjoy the sunset beside the lakeshore.